Coyotes have made their home here on Cape Cod. First arriving about 20 years ago, they are now quite a common site around here. 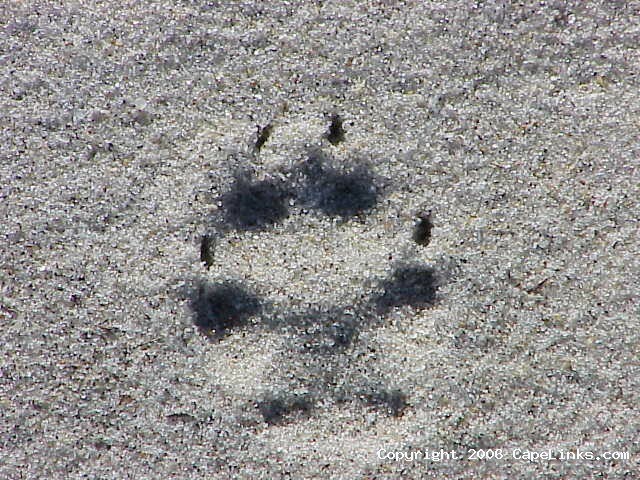 This is a picture of a coyote track on Chapin Beach in Dennis, MA. Coyotes hunt in the sand dunes here for rabbits. There are (or used to be) tons of rabbits in these sand dunes. This coyote track is about 2” wide by 2 1/2” long. This image has been viewed 26022 times and 4 people have commented. You may leave a comment about this image. You can also view more Nature and Cape Cod images or learn more about Cape Cod.